Setting Data were collected between October 2015 and October 2016 in homeless hostels and day centres and with staff from primary and secondary healthcare providers and social care services from three London boroughs. Participants People experiencing homelessness (n=28), formerly homeless people (n=10), health and social care providers (n=48), hostel staff (n=30) and outreach staff (n=10). Methods In this qualitative descriptive study, participants were recruited to interviews and focus groups across three London boroughs. Views and experiences of end-of-life care were explored with people with personal experience of homelessness, health and social care professionals and hostel and outreach staff. Saturation was reached when no new themes emerged from discussions. Results 28 focus groups and 10 individual interviews were conducted. Participants highlighted that conversations exploring future care preferences and palliative care with people experiencing homelessness are rare. Themes identified as challenges to such conversations included attitudes to death; the recovery focused nature of services for people experiencing homelessness; uncertainty regarding prognosis and place of care; and fear of negative impact. Conclusions This research highlights the need for a different approach to supporting people who are homeless and are experiencing advanced ill health, one that incorporates uncertainty and promotes well-being, dignity and choice. We propose parallel planning and mapping as a way of working with uncertainty. We acknowledge that these approaches will not always be straightforward, nor will they be suitable for everyone, yet moving the focus of conversations about the future away from death and dying, towards the present and the future may facilitate conversations and enable the wishes of people who are homeless to be known and explored. This is the largest qualitative UK study to date exploring the views and experiences of people who are homeless and those supporting them regarding conversations and approaches to palliative care. The views of rough sleepers who are not using day centres are not represented in this research. People who were intoxicated were unable to provide informed consent, and so did not participate. Thus, people experiencing homeless who also have severe substance misuse issues are likely to be under-represented. Given the exploratory nature of the research, the characteristics of participants could not be predetermined. People experiencing homelessness were initially approached regarding participation in the study by hostel and day centre staff. It is therefore unknown who declined to participate, how or whether they differ from those that took part and the extent to which gatekeeping impacted recruitment. Our previous research highlighted a lack of meaningful conversation around the future wishes and care preferences of people experiencing homelessness in the UK16 leaving the preferences of many people with advanced ill health unknown. In this paper, we explore in more detail some of the reasons why these conversations are not taking place from the perspectives of both people experiencing homelessness: formerly homeless people and those supporting them. To explore the views and experiences of people experiencing homelessness, formerly homeless people and those supporting them regarding conversations and approaches to palliative care. Participants in this qualitative descriptive study were recruited from three London boroughs, selected for their high numbers of both people experiencing homeless and homelessness services.39 40 Frontline homelessness staff and health and social care professionals were recruited through mapping homelessness services within these boroughs.40 Formerly homeless people were recruited through homelessness charities: Pathway,41 Groundswell42 and St Mungo’s.43 People experiencing homelessness were identified and recruited by staff at homeless hostels and day centres, as advised in consultations with hostel staff and people with lived experience of homelessness. Given the exploratory nature of the research, the characteristics of participants could not be predetermined. CS had encountered some but not all of the hostel staff and healthcare professionals in her clinical work. Eligibility criteria are outlined in box. People with current and previous experience of homelessness were provided with a £10 supermarket voucher for participation. Full details of recruitment and data collection are described elsewhere.16 Participants were offered the choice of taking part in a focus group or individual interview, as advised in consultations with people with lived experience of homelessness and hostel staff. *People with lived experience of homelessness and hostel staff advised us to use 6 months as the marker for housing status. 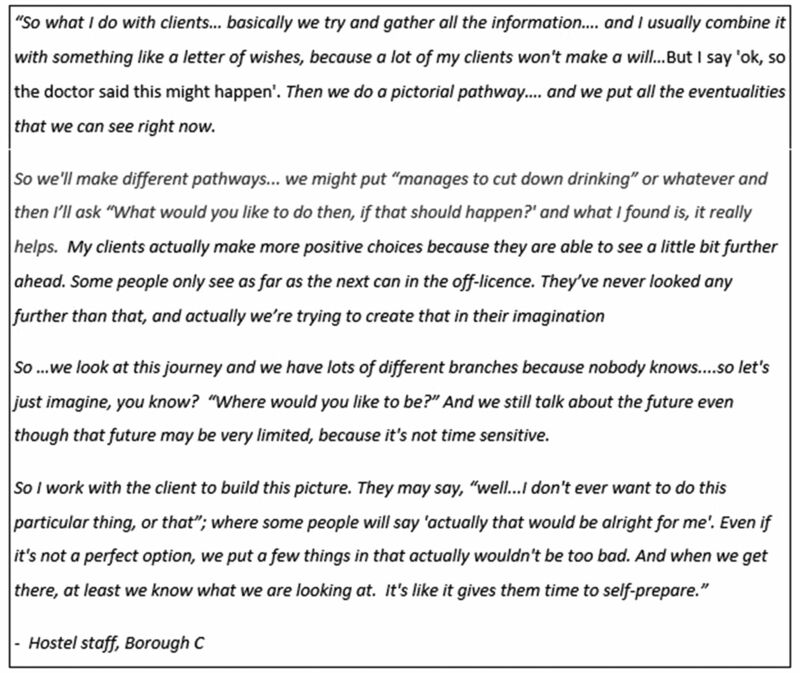 Focus groups were based around a vignette (figure 1) and lasted approximately 3 hours for hostel, outreach staff and formerly homeless people and 1 hour for health and social care providers and people experiencing homelessness (see online supplementary file S1). They took place in locations that were convenient and known to participants. All participants completed demographic sheets. Data collection was audio recorded, transcribed verbatim, field notes were taken and summaries circulated to participants. No changes were requested. No repeat interviews were conducted. Vignette used during data collection. Written consent was obtained from formerly homeless people and staff. Following consultation with hostel staff and formerly homeless people, verbal consent witnessed by a key worker was deemed the most appropriate consenting method for people experiencing homelessness as disclosing literacy difficulties was felt to be potentially off putting for some. Initial codes in the data set were identified through examination of summaries and field notes taken during data collection, and discussion between BH and CS. Data-driven, line-by-line coding was undertaken by BH, and new codes were created as necessary in addition to those identified in field notes to reflect the data. The codes were then analysed and grouped to create higher level candidate themes and subthemes to categorise the data. These were refined following discussion (BH and CS) and returning to transcripts for verification. These candidate themes and subthemes were discussed with a wider group of healthcare professionals, researchers and formerly homeless people, who formed the research steering committee, for authentication. Twenty-eight focus groups and 10 individual semistructured interviews were conducted with 127 participants (28 people experiencing homelessness, 10 formerly homeless people, 49 health and social care providers and 40 hostel and outreach staff). Participant characteristics are outlined in table 1. Over a third (11/28) of people experiencing homelessness had been homeless for over 5 years, 24/28 participants had slept on the streets (slept rough) and 20/28 reported currently mainly sleeping in hostels (table 2). Challenges to conversations about palliative care, future health options and preferences identified in this research are categorised into four main themes (table 3). Both service users and staff found death difficult to discuss. Hostel and outreach workers experienced discomfort in raising topics related to the potential death of a service user in many situations, including conversations between staff. The reluctance and avoidance of talking about death and dying expressed by staff was often mirrored by people experiencing homelessness who tended to focus on the present rather than future care needs. Service user: that is so depressing man…What’s the point… If he’ll be dead in 6 months? Other people experiencing homelessness expressed denial or disbelief that behaviours or an illness could lead to death. This recovery focus does little to encourage dialogue around the fact that young people experiencing homelessness may not always be able to ‘recover’. Hostel staff have very little experience around exploring options other than supporting engagement with substance misuse services for people with addiction issues. It was also very difficult for staff to talk about palliative care preferences with people who were young and who had, for example, advanced liver disease, knowing that if they were to stop drinking the disease progression may stop and they could potentially live for many more years. This contributed to their belief that they should ‘never give up’ on someone. Furthermore, many staff felt as if they had failed someone if they ‘couldn’t save them’. These factors accentuated dissonance in identifying young people with potentially treatable conditions as patients requiring palliative care. This posed a block to conversations around the potential benefits of palliative care for this group. There was recognition of the vulnerability and fragility of many people experiencing homelessness by all participant groups. Hostel residents described how substances or alcohol may be used to ‘numb’ or block painful memories or experiences. This fragility and avoidance also posed a challenge to discussions about palliative care as people experiencing homelessness did not want to contemplate worsening health and possible death. Researcher: Do you think that people here [in the hostel] are…concerned about…the fears of dying? Hostel resident: A lot of them [people experiencing homelessness] probably have seen a lot of trauma in their lives. And they want to get away from it so they drink a lot. But then, they don’t go and see GPs because they don’t want to hear the realities. Staff feared that raising issues related to palliative care and deteriorating health may be detrimental to service users’ well-being, their relationships with them and the potential for future engagement with services. Participants were also concerned that palliative care discussions may cause service users to feel abandoned, which may paradoxically lead to an increase in harmful behaviours, rather than an opportunity to consider how to improve quality of life. The uncertain trajectories of people with illnesses such as advanced liver disease was particularly challenging. People with advanced liver disease could appear gravely ill but, following emergency hospital treatment, improve considerably. Examples were given of individuals being issued warnings such as ‘if you don’t stop drinking, you will be dead in 6 months’ which were rarely followed by discussions about choices. Participants described witnessing people issued with such warnings living far longer than expected. This did little to motivate change or desire to plan. The uncertainty about services that could provide support for people who are homeless with advanced ill health posed a major block to conversations about palliative care as many professionals felt they had no alternatives to offer. It was also not clear to hostel staff whether hostel residents would be able to access traditional providers of palliative care, such as care homes due to the young age at which they may require them. Often care homes were inaccessible as they accept patients who are 65 years or older. Much uncertainty was therefore expressed about when to have conversations about palliative care. Given this uncertainty, many participants felt identifying someone as being at the end of life was necessary before discussions could take place. As certainty in this regard was rare, and information sharing often incomplete or inadequate, this posed a major block to palliative care conversations. For people with illnesses such as cancer, with more predictable trajectories professionals reported more success in accessing services. Further uncertainty surrounded which professional groups would be best placed to have discussions with people experiencing homelessness about palliative care. Some hostel staff felt healthcare professionals would be in a better position, given their medical experience and knowledge. Hostel staff also described lacking confidence, related partly to recovery-focused approaches, their lack of medical qualifications and apprehension about managing the consequences of such conversations. However, healthcare professionals cited their lack of developed relationships with people experiencing homelessness and limited experience of the challenges of homelessness as challenges in broaching these issues. While many hostel staff did not feel comfortable or confident discussing palliative care, some described discussion strategies that recognised the uncertainty and complexity of supporting service users with advanced ill health. These strategies involved respecting decisions made by individuals, while always providing support and the opportunity to change their mind. Figure 2 outlines how one hostel worker incorporates uncertainty into discussions about deteriorating health and palliative care. Discussions focus on the individual’s insights and wishes, including an exploration of how this might change should their health deteriorate. The emphasis is on empowering people to think and talk about future care options they feel are acceptable, and those which are not. Incorporating uncertainty into discussions about the future with homeless people with advanced ill health. This research highlights how conversations with homeless people about deteriorating health, the future and care preferences are currently largely avoided due to discomfort and for fear of damaging relationships or making situations worse. If talking about preferences with homeless people with ill health was reconceptualised as a conversation about how a person could be supported to live well, rather than die well, it may be an easier topic to broach. There is a need to incorporate parallel planning into the care and support of people experiencing homelessness whose health is a concern, given the uncertainty described in this research. In this research, we noted avoidance, denial and reluctance among people experiencing homelessness to talk about death, dying and the choices available to them as their health deteriorates. Healthcare professionals described their lack of developed relationships with service users as a barrier to palliative care discussions. In previous research, nursing students described anxiety around discussing death and dying with this group, yet completion of the advance directive with this group was rated as less challenging than anticipated.47 People experiencing homelessness have been willing to talk about end-of-life care wishes24 and complete advance directives48 in previous research, particularly when one to one support is provided.19 35–37 In this research, avoidance and denial of these issues was apparent. Spirituality has been identified as an important factor when considering end-of-life wishes with people experiencing homelessness in previous research19 24 27 yet was not reflected in our findings. These contrasts highlight the need for psychologically informed, person-centred approaches to supporting people experiencing homelessness and respect for individual preferences.49 50 Many homelessness services in the UK are adopting a ‘psychologically informed environment’ (PIE) model.51 The aim of PIEs is to ‘enable people experiencing homelessness to make changes in their lives’.52 For people who are homeless and also potentially have palliative care needs, this could extend to consideration of how to improve quality of life, however long that lasts. Uncertainty, particularly for people with liver disease, presented a range of challenges for palliative care discussions with people experiencing homelessness in this research. Uncertainty for non-homeless patients with liver disease has been described as a barrier to palliative care,53–56 yet the early introduction of palliative care for patients with liver disease (awaiting transplantation) has proved beneficial in improving mood and reducing symptom burden.57 The majority of previous research exploring parallel planning and early introduction of palliative care has been with non-homeless patients with cancer,58 59 for whom the trajectories of illnesses are clearer. Mishel’s reconceptualised uncertainty in illness theory61 62 views uncertainty as an opportunity for change and growth. In line with this theory, and based on the findings of this research, we proposes that uncertainty around a person’s illness could be viewed as an opportunity to engage people in conversations and planning about a range of potential outcomes (using parallel planning). By having conversations about current health and preferences for palliative care with people experiencing homelessness about whom staff are concerned, rather waiting until some has been idenitfied as ‘palliative’, uncertainty may be reappraised as an opportunity for planning, rather than a barrier to conversations or action. We suggest that early discussions about a person’s health, their behaviour and their aspirations may empower them to re-appraise the uncertainty surrounding their health. For example, moving the emphasis of conversations from warnings (you are going to die if you do not stop drinking) to discussions (what do you want or feel able to do at present about your drinking?) may make conversations about quality of life, and eventually palliative care more palatable. Hostel staff described huge uncertainty and a lack of options for services users with advanced ill health. In response, we propose facilitating greater multidisciplinary working to both support hostel staff and raise the understanding and awareness of other professional groups regarding the needs and preferences of people who are homeless. In our research, the fear of talking about death and about causing more harm than good through bringing up sensitive issues was a major block to conversations. We propose that conversations about how individuals see their health and what they think might help them feel better may be a more accessible way to begin to identify and address some health issues. A suggested strategy for incorporating a parallel planning based approach for people experiencing homelessness is outlined in figure 3. A multidisciplinary response to exploring the concerns and wishes of people experiencing homelessness and those that support them to facilitate a person-centred approach to care. In this research, we have seen that the health of many people experiencing homelessness is poor; therefore, this model may be appropriate for many people with complex needs. In order to focus more specifically on people who may require palliative care, we suggest that consideration of whether staff feel a client’s health is of significant concern could act as a trigger for thinking about future care preferences and planning, rather than waiting until a person has been identified as palliative before conversations about insights and preferences begin. This does not mean active treatments and recovery-focused options cannot be pursued simultaneously, but may help in the development of multiple plans, that can be adopted as and when needs or preferences change. Conversations exploring the individual’s conceptualisation of their health and their options, and what they feel could improve their quality of life may be easier to initiate than conversations about deteriorating health, death or dying. Figure 3 does not specify who should initiate such conversation as the most appropriate person (or persons) is likely to vary for each individual. In the research, we heard how node-link mapping (NLM)63 was used by some hostel staff to explore aspirations and future palliative care preferences. NLM is based on the same cognitive behavioural principles as motivational interviewing63 and enables people experiencing homelessness to dictate the content and pace of conversations exploring their health, their perceived options and their future wishes. NLM involves structuring and visually representing issues on a series of maps which may relate to a single topic (eg, substance or alcohol use) or may represent concepts such as health or well-being. This facilitates the identification and exploration of shared meanings, goals and care preferences, which can be pictorially represented and recorded.64 Over time, if both parties feel comfortable to explore these areas, such conversations may extend into discussions about potential future palliative care preferences. In light of the uncertainty and pressure perceived by hostel staff, greater multidisciplinary working could support staff and service users by bringing together learning and expertise from different professional groups to respond to the needs and preferences of service users. The responsibility of supporting the wishes of the individual is shared, potentially reducing burdens experienced by hostel staff. Potential challenges to supporting the individual’s wishes could be discussed to create mutual understanding and provide the opportunity to develop multiple, realistic, parallel plans to facilitate person-centred planning and care. An important aspect of this approach is returning to the individual to assess their current wishes and concerns. Plans may need to be reviewed and adapted (both best case and worst case plans) to ensure that they are responsive to potentially changing needs or preferences. This is the largest UK study exploring views and experiences of people experiencing homelessness and those supporting them regarding palliative care conversations. While all participants were service users or providers in London, the challenges described and the strategy suggested for managing uncertainty could be beneficial in other locations. The voices of people experiencing homelessness are represented throughout this research; however, those with severe substance misuse issues and those sleeping rough (and not accessing day centres) are likely to be under-represented. Our results were discussed within a steering group composed of people with lived experience of homelessness, palliative care researchers and clinicians and professionals in inclusion healthcare who concurred that the findings resonated with their experiences. Methods for providing palliative care support for people who are homeless need urgent consideration. The lack of facilities that can provide adequate support to people who are homeless with high support needs demonstrates the need to strengthen and foster collaborations between partners from health, housing, social, homelessness and palliative care services. Also, given the uncertainties in supporting people who are homeless and experiencing advanced ill health, we propose parallel planning as a method for identifying, exploring and respecting the wishes of individuals as their health deteriorates. For some people, moving the focus of conversations away from ‘recovery’ towards ‘living well/quality of life’ has the potential to facilitate more patient-centred, multidisciplinary care and contingency planning. Future research is needed to explore the viability of this approach and evaluate its effectiveness. It is essential that all professional groups are provided with training and support (potentially from palliative care services) to bring about this shift in thinking, and that robust evaluation of this training is completed. This research highlights the need for a different approach to supporting people who are homeless and are experiencing advanced ill health, one that incorporates uncertainty and promotes choice. We propose parallel planning and mapping as a method for working with uncertainty and complexity. We acknowledge that this approach will not always be straightforward, nor will it be suitable for everyone, yet moving the focus of conversations about the future away from death and dying, towards the present and the future may a helpful place to start. The authors would like to thank the managers, employees and users of homelessness services across the three London Boroughs.
. Homelessness Kills: an analysis of the mortality of homeless people in early twenty-first century England. London: Crisis and The University of Sheffield, 2012. 978-1-899257-78-2.
. ‘Nowhere else will take him’ – Palliative care and homelessness. J Palliat Med 2017;24.
. Dignity in design: the siting and design of community and shelter-based health facilities for homeless person. In: Guirguis-Younger M, McNeil R, Hwang SW. Homelessness and Health in Canada. Canada: University of Ottawa Press, 2014:233–51.
. Dying while homeless: is it a concern when life itself is such a struggle? J Clin Ethics 2005;16:251–61.
. Developing palliative care services in regional areas. The Ipswich Palliative Care Network model. Aust Fam Physician 2001;30:59–62.
. Harm reduction and palliative care: is there a role for supervised drug consumption services? J Palliat Care 2012;28:175–7. ISSN 08258597.
. Atlas of services for homeless people in London: London Housing Foundation, 2016.
. Saving lives, saving money: how homeless health peer advocacy reduces health inequalities. London: The Young Foundation, Groundswell, The Oak Foundation, 2016.
. Beyond appearances: A critical realist approach to social constructionist work. In: Nightingsale I, Cromby J. Social constructionist psychology: a critical analysis of theory and practice. Buckingham, 1999.
. Complex trauma and its effects: perspectives on creating an environment for recovery. Brighton: Pavilion Publishing, 2012. Contributors CS, PS, SD and JL conceptualised the study. CS, BH, JD, BV and PK collected the data. BH and CS analysed the data. BH drafted the initial manuscript. CS, PS, JL, NH, DH, JD, BV, PK, SD and NB reviewed the manuscript, approved the final manuscript and agree to be accountable for all aspects of the work. Funding Initial seed funding and support for this research was provided by Coordinate My Care to facilitate CS in the development of this research, following which a grant was obtained from The Oak Foundation (OCAY-14-574) to support BH’s post. Professor Paddy Stone – Marie Curie Chair in Palliative and End of life care is supported by Marie Curie Chair’s grant – 509537 BV – Senior Research Associate is supported by Marie Curie Chair’s grant – 509537 JL – Senior Research Fellow is supported by Marie Curie Programme and Core grants (50% Programme; 50% Core) – 531645 (Programme) and 531477 (Core) SD– Research Nurse is supported by Marie Curie Programme grant – 531645. NH and JD are Pathway Employees. NB is employed by St Mungos. Ethics approval Ethical approval was obtained from the Research Ethics Committee of University College London (reference-6927/001). Data sharing statement No additional data are available for this article.